MERRY CHRISTMAS At the recent Club of Anchor Friends meeting, I obtained a large number of pictures of buildings which were built many years ago. 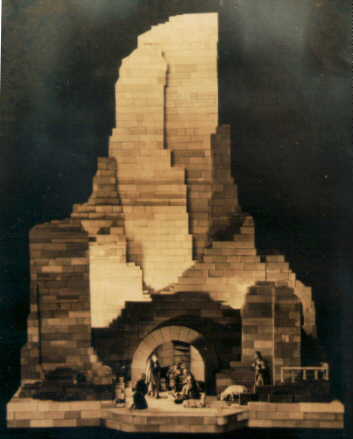 The dramatic Nativity scene at the left was built by a Mr. Jansen of Aachen. If the quality of the picture is not very good, blame it on the fact that it comes from a picture of a photograph in an album. The album, and its photographs, are not available for making quality reproductions. For the Christmas season, I am devoting the builder's page to the designs of several modern builders, AVs Schiph (USA), Fitchner (Germany) and Wellmann (Germany). What they all have in common is that their buildings were constructed 100% from the new Anchor stones, which are currently available in most countries. Wolfgang Fichtner combined the stones from puzzles and building sets to achieve some very interesting design details. See if you can find them. OK. If you want to, you may consider the page this month as a Christmas advertisement for the new Anshor Stone Building Sets. Even if you have only a limited amount of time to spend looking at the Anchor web site, I urge you to at least go to the "builder's page", which features Anchor buildings by Anchor people from around the world. The pictures are changed every month. Today, there are many collectors and builders using Anchor Stone Building Sets. These collectors often participate in setting up Anchor displays at various exhibitions. A number of them are members of the international Club of Anchor Friends (Club van Ankervrienden), a Dutch club with members from the Netherlands, Belgium, France, Germany, Austria, Switzerland, Great Britain and the USA. Sets and puzzles are being produced again! The quality is high. I urge people interested in starting Anchor building, and those who want to provide their educational benefits to their children, to consider buying new puzzles and sets. I also have available a limited selection of old sets, including a new set and some special prices. Anchor Stone Building Sets are great presents, and the supplement sets make wonderful follow up gifts. These new sets recently won the 1997 Parents' Choice Gold Medal. For an 1880 toy to win in 1997 says a lot about the quality of these sets and Anchor in general. The CVA has published its Stone Catalog, which covers all of the stone shapes Richter made, plus shapes made by other innovators. Metal parts and most other accessories are included in the catalog. The contents of the sets are also listed. The cost of the catalog sheets (European size paper, intended for loose leaf use) is f 40, plus postage costs, in Europe. I bought four copies at the recent spring meeting, along with European four hole binders. All of them are already gone. The cost, including postage, was $40. I brought back six in November, but without the binders. So they will cost only $25, including postage. But you will need a loose leaf type binder, and A-4 paper is a little longer than standard American paper. All Anchor people need, and will want, a copy. Owners of earlier copies of the CVA Stone Catalog should contact me. I brought back replacement pages for the catalogs already sold. This is the second set of replacement pages. As before, the replacement pages are free. Web Page Notes: Most subpages do not change from month to month. I have decided to add the note "(new)" after those subpages which have undergone major changes recently. The "builder's page" and "my page" are revised every month. A few people have asked me to number the "issues" of the Anchor page. Well, they started in August, 1996, so this "issue" is Vol. 3, # 11 (with Vol. 1 starting with # 8, to keep the number of the month the same as the issue's number). For the month of December, 1998. You are visitor number to the Club of Anchor Friends' home page since the hit counter began to work on February 6, 1998. Late last month the page passed the 3650 milestone. From the first appearance of the Anchor home page, August 30, 1996, there has been a slow but steady increase in the number of people accessing it. I have been updating this site monthly since August, 1996.